The Story of ‘You’ is available in paperback and Kindle editions; The Infinite Journey is available in paperback with the Kindle edition coming soon. Please order from your preferred bookstore or online retailer and join our mailing list and/or ‘like’ our Facebook page to keep informed about publication dates and other news. Reviews (on Amazon, Goodreads etc), and mentions/shares on social media are greatly appreciated! If you want to contact me personally please use the contact form. This book is a rare book. It is nothing less than a masterpiece because it thoroughly dismantles the spell of the mind, Personality (Ego). I’ve been on the spiritual path for 18 years and have never before come across a book like this. The big ‘Aha!’ was to realise that the much sought-after awakening was nothing like the hyped-up awakening we hear about on the spiritual path but simply a return to what is already so natural – The Natural State, as Jez calls it. 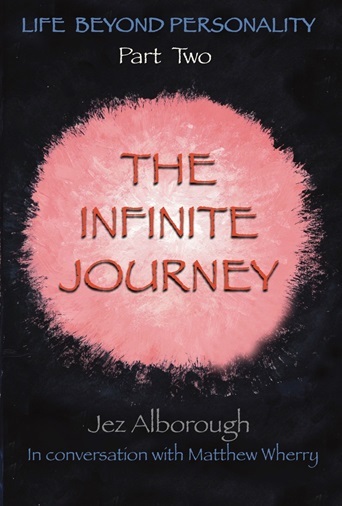 Jez’s work here is all about that … Never before has it been so possible for folks on the spiritual path to see completely through identification with the Personhood (Personality), drop it and return to what is already the case… The Natural State of pure free-resting alive consciousness. This book completely penetrates and reveals the workings of the Personality and how it controls life through contraction, repression and distraction thus causing the loss of the natural awakened life that is our birthright. Throughout the course of this book, you are presented with the opportunity to gain a direct experience of the Original You that lies beyond the conditioned beliefs that have led you to think otherwise. This is not another self-help book designed to create a better you; a better you is just another self-placating unnatural false belief that can only lead you away from the Natural You. Instead, it is all about getting out of the way so that the Original and Natural You can be revealed through direct experience. If you engage with the author as he relates the story of his experience, it is through your own creative imagination, and to the extent that you remain open to the possibility that you just might not be who you think you are, that you may begin to let go of long standing deeply conditioned beliefs that have misled you and thus no longer serve you. In taking back the authority that you have innocently given away to your peers and elders at a very young age, you might find that your instinctive drive to be a member of a limited tribe, is replaced with the intuitive knowing that You have always, and have never not been, a unique member of the Absolute and Unlimited Tribe of Oneness; and the natural radiant essence of the Absolute and Unlimited Tribe of Oneness is both known and felt directly through the profound experience and Joy of remembering your original true and unconditioned state of Love. I wish to express my sincere thanks and gratitude to the author, Jez Alborough, for writing this helpful and most insightful book. I’m looking forward to Part 2 – The Infinite Journey. The Story of ‘You’ is a wonderful, in-depth exploration of Personality and our core wound and suffering. The dialogue format works very well; perhaps because it’s an authentic conversation that clearly mirrors what we would normally inquire into if new to this inquiry into Natural Being and Personality. It’s also free of academic jargon, so the energy behind the words comes across with greater force. As we take this dialogic journey as the reader, the Personality cannot avoid being unmasked. I look forward to reading the second volume. The multi-talented Jez Alborough, creator of numerous children’s classics, such as HUG and DUCK IN THE TRUCK has done a very surprising thing – he’s produced a deeply personal book for adults about his own spiritual journey. This is a fascinating story… when he was born, Jez’s mother suffered from postnatal depression, and Jez ponders whether this resulted in a lack of nurturing during his formative years. At any rate, it sent him on a lifelong quest for some kind of deep spiritual fulfilment – a search for the one great reality beyond our limited personalities. As a boy, Jez experienced Blake-like moments of transcendence and bliss, which he calls ‘Openings’. These experiences left him with a direct understanding that there is more to this life than the banality of day-to-day living. Jez is remarkably candid about his own personal struggles. Having experienced major success as an author and illustrator; Jez suffered some form of mental collapse, which seemed to threaten everything. Slowly he began to realise this could in fact be a profound turning point, because when everything we rely on is removed, nothing remains but the stark reality of who we truly are. Very few of us have the courage to explore that frightening truth, but Jez does so with humour and honesty in an easy-to-read interview form. An articulate and profound exploration of the stuff that really matters. Give that man a HUG! This is the clearest explanation of personality I have read… I urge you to read it. At long last a book that truly helped me to understand what the personality is (others may use the word ‘ego’). The format is practical – questions answered with clear non-airy-fairy clarity. A glossary is even provided which in itself I found so helpful. I am fed up with searching and now realise that this seeking just reinforces the personality. This book has made me look inwards and see how I identify with the personality and how I am innocently reinforcing it! Normally I finish a ‘good’ ‘non-duality/spiritual’ book thinking I’ve learned a lot, but that’s the problem, more layers of teaching taken up by the personality, creating a newer more ‘awake’ personality… just ‘self’-development. The author helped me see beyond this. I can’t recommend enough! The format is brilliant. This is one of the most lucid books I have read to date on the hugely complex subject of Personality. A step-by-step analysis of how it comes into being, how we myopically see the world through its prism and how it stealthily comes to define and determine our lives. The Story of ‘You’ is a must-read for all those journeying to find greater understanding of their unconditioned true selves, and is a book, particularly due to its clarity and lay-out, that schools and universities might do well to include on their reading lists for future generations to learn from and relish. I really enjoyed Jez’s simple yet profound perspective on how by identifying so strongly with our personality we lose connection with the truth of who we really are causing us tremendous pain and suffering. The conversational/discussion style of the book opened it up to many questions and answers as to why we suffer so greatly and offers us the opportunity to reflect on how our own personalities have been formed on the journey from infant to adulthood and how much this has limited our true potential. Jez also explains how the loss of innocence and life’s conditioning causes us to contract and become a little separate me severing our connection to our own being which is love. If you are curious to discover who you really are beyond your personality delivered in a direct non dogmatic style then I would highly recommend this book. Thanks, Jez!